Concerning Mike Bickle, the International House Of Prayer’s false Kansas City prophet and purveyor of New Apostolic Reformation/Latter Rain doctrine, Apprising Ministries recently told you that Francis Chan Is Wrong For Endorsing NAR Teacher Mike Bickle. Then yesterday I pointed out that Dr. Michael Brown, host of The Line of Fire radio program and widely respected theologian in many charismatic circles, has come to the defense of the indefensible: Dr. Michael Brown Defends Word Faith Heretic Benny Hinn. 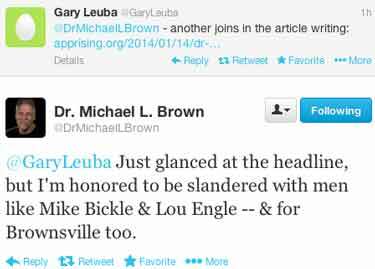 That post featured Brown’s spirited Twitter exchange with Steve Camp, pastor-teacher of The Cross Church, who correctly took Brown to task for his conduct on the television program of Benny Hinn. It’s beyond question that Hinn’s a notorious Word Faith (WF) preacher. It would seem from this that Michael Brown doesn’t believe Benny Hinn is “as bad as” critics e.g. like Watchman Fellowship have previously pointed out.1 Well, here’s a clip from Benny Hinn’s You Tube page published this past December 24 featuring Hinn with so-called “prophetess” Juanita Bynum. Bynum has become an example of inspiration, hope, and new life to men and women around the world. She has turned her humble beginnings into an inspirational and philanthropic empire for educating, equipping and empowering people from all walks of life. The point of this piece is simply to archive and document this for you because the pages containing these kinds of admissions often seem to vanish. So, in closing this for now, for more information on false prophet/quasi-apostle Mike Bickle I refer you to the Mike Bickle – I.H.O.P. page of Apostasy Watch. In fact, much of Bickle’s terminology will be strange and foreign to most Christians… Bickle’s movement is based on allegorized scripture, deeper life pietism, and mysticism, representing a slightly modified version of the heretical Latter Rain movement of the 1940s. Bickle claims that he began his ministry through the hearing of an audible voice of God in 1983 that told him to start 24-hour prayer in the spirit of the tabernacle of David. The Significance of Youth-Filled Stadiums: Revisiting the Old Latter Rain Prophecy in Light of Current Events from Herescope is a good place to get started with what NAR Apostle Lou Engle is about. You may recall I showed you Engle is also moving closer to the mainstream as well in Louie Giglio, Passion 2013, And Jesus Culture. Dr. Michael L. Brown rightly could be called the critic of the critics. His nickname of “knock ‘em down Brown” (acquired a number of years ago by his ability to “slay in the Spirit”) could easily be retooled to describe his response to the critics of the Pensacola-based church where he is resident theologian. In it he suggests that the doctrine and practice of the “Pensacola Outpouring” is biblical and of God. However, some of the troublesome things, like the false declarations of Pastor John Kilpatrick and Evangelist Stephen Hill and the bizarre manifestations, are conveniently passed or glossed over. As one who was saved in a charismatic church, and has been documenting for you evangelicalism’s move away from sola Scriptura, I can tell you that this would all be par for the course. Too many people today are running around claiming direct revelations from God and then making Scripture conform to their fickle feelings.